It’s an enigma to most people: search engine optimisation. The problem with SEO is that it includes many factors. One article that you felt you performed great SEO to may get little to no traffic while one with poor SEO will get thousands of views. However, you can’t be too disheartened and give up on search engine optimising your articles because there are things you can do which can guarantee a higher exposure to your article: simple tips which you can implement when creating an article can have such a big difference. When it comes to making articles, many people (actually everyone!) focuses SEO and stereotypes it to be words. When you perform SEO, you put keywords in the introduction etc. Yet, there is as much SEO in images as there is in words. If you create a word-rich article and place an image in the article, you can have the potential to get double the traffic. Why? Without an image in your article you can only get traffic from Google search, Bing search, Yahoo search etc. When you place an image in your article, you open the doors to the likes of Google Image search and so on.. Which is an article about Domain names in PPC adverts! ‘PPC advert’ is a keyword that million fight over for to get onto page 10 let alone page 2! I hope this gives you an insight to how powerful images are to exposing an article. Introduction – An introduction should basically sum up what the article is going to be about. Therefore, naturally, you should include lots of keywords that are linked to what the article is about. Google look at introductions of articles more than anything. Therefore, make sure its full of related keywords. The idea of an introduction is to get the visitor to the article through SEO. First Paragraph – This paragraph can now be less related and can go off on a different tangent. This gives your article the potential to have SEO about different topics that are tangent to your topic. Main Body – Here is where the majority of your article goes. The best way to SEO this section is link highly ranked keywords to articles about that keyword. 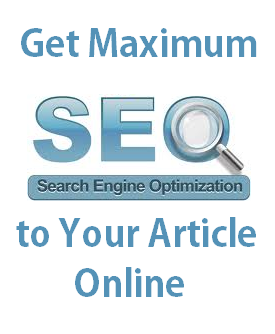 This will make Google give your article a higher pagerank. Conclusion – This part of the article can be deemed as the least capable of SEO. Therefore, you don’t have to include many keywords. Just make sure you can keep the visitor on your page by getting them to click onto another article! There are three things you can take away. One, always include images in an article to gain more exposure. Two, structure your article for best SEO. Three, simple steps like this are sometimes the most effective away to get maximum exposure. Look at your article after you have created it and ask yourself SEO questions. Have you got keywords in your intro? Have you got an image? When you can say yes to all your questions, you are ready to publish it and see the traffic roll in.